Justin Lofton continued his streak of top-10s on Friday at the Texas Motor Speedway after driving his No. 6 College Complete (http://www.collegecomplete.com, 877-543-2655) Chevrolet Silverado to a ninth place finish, allowing him to increase his points lead in the NASCAR Camping World Truck Series (NCWTS) from one to five over Timothy Peters. Lofton, who now has seven top-10 runs in the first seven races, could have seen his night end drastically different after a caution flag with less than 40 laps to go nearly caught him a lap down. This team has a way of not giving up, we had a few near misses from tire rubs to caution flags and other issues out of our hands, but we didn't give up and that is what got us back up there. Justin Lofton continued his streak of top-10s on Friday at the Texas Motor Speedway after driving his No. 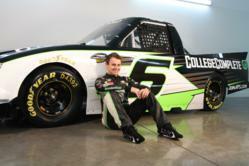 6 College Complete (http://www.collegecomplete.com, 877-543-2655) Chevrolet Silverado to a ninth place finish, allowing him to increase his points lead in the NASCAR Camping World Truck Series(NCWTS) from one to five over Timothy Peters. Lofton, who now has seven top-10 runs in the first seven races, could have seen his night end drastically different after a caution flag with less than 40 laps to go nearly caught him a lap down. Lofton led the field to green for the WinStar World Casino 400K on Friday night after inheriting the pole based on the NASCAR rulebook after persistent rain knocked out qualifying on Thursday. Once the 167-lap race was underway, Lofton took advantage of the track position, pulling away with the race lead for the first 26 laps. 20 laps later, the yellow would wave again, and this time, strategy came into play. As crew chief Dan Bormann reviewed the fuel window and decided whether or not to pit, Lofton stayed on track. Other lead lap trucks opted to pit. The call put Lofton's College Complete entry back atop the leaderboard.